Ever since I can remember, I’ve wanted to fly. I now have over 25 years of flying experience, and flying remains an endless source of keen interest and profound enjoyment. I specialize in glass-cockpit, technologically advanced aircraft (TAA), but I welcome the opportunity to help all aspiring pilots earn their first license and advanced ratings. 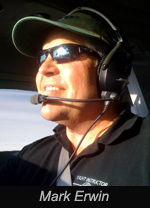 In addition to initial Private Pilot training, I provide training for instrument rating, multi-engine rating, high-performance endorsement, complex endorsement, instrument proficiency check (IPC), biennial flight reviews (BFR), rental aircraft checkout, and pilot requalification. Other instructors may have similar experience and credentials, but I doubt that many possess my passion for teaching. Unlike flight instructors who teach to rack up flight time to qualify for an airline job, I teach people to fly because that’s what I love. My students have ranged in age from 17 to over 70, I take an interest in each of them, and I’ve enjoyed the challenge of adapting my teaching style to suit each one of them. I hope you’ll give me the chance to teach you to fly and come to think of me as your personal trainer in the sky. The best time to start flying? NOW! Learning to fly does take some time and some money. Most important, I’ve discovered, is the desire to fly. To those of you who hold pilots licenses but haven't flown in many years, I have a special message: it is NEVER too late to return to flying. Remember, your license remains valid; like any pilot, you simply need to pass a medical exam and Biennial Flight Review. Depending on how long you've been away, some recurrency training may be necessary to restore your proficiency level. Yes, some time and effort are required, but your payoff will feel boundless!